A black and white photograph of the Ontario County Courthouse. View shows the west side of the courthouse. The Ontario County Courthouse was built from 1852-1854 on the west side of Centre Street between Ontario Street and Gilbert Streets. The architects were Frederic Cumberland and William Storm of Toronto. The extension at the north end was added in 1866. The building served as a courthouse from 1854-1964. 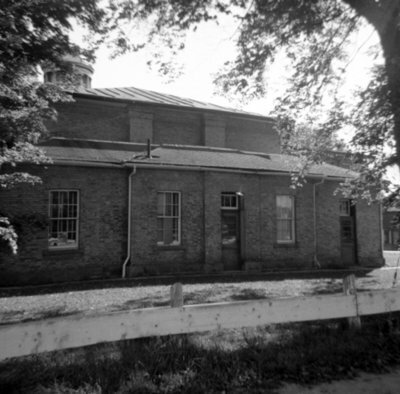 In 1967, the building was renovated as part of Whitby’s centennial project for use as a community centre. In celebration of its 150th anniversary, the building was again renovated in 2003 and is now the home of the Whitby Court House Theatre and Whitby Brass Band. The building has been renamed and is known as the Whitby Centennial Building. It is located at 416 Centre Street South, Whitby. Ontario County Courthouse, September 25, 1965, Brian Winter. Whitby Archives A2013_004_406. Scanned from a brownie camera negative.